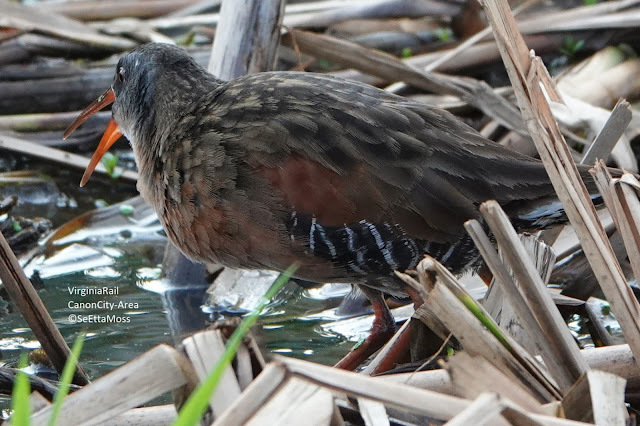 This Virginia Rail is one of two I found in a private pond in the Canon City area that is mostly overgrown with cattails. Note it's bill was just this bright in my photo, it is not enhanced--I think it came out so bright because it was dusk lighting. In the past I have found rails in ponds/wetlands with heavy amounts of cattails. As seen in these brief video clips, the Virginia Rail effortlessly walks into and out of the cattails providing 'now you see it, now you don't' action. VirginiaRail-a2 from SeEtta Moss on Vimeo. The National Audubon website says, ".... the long-billed Virginia Rail eats mostly insects." It astounds me that Virginia Rail are huntable in many states including Colorado. Fortunately it doesn't appear that there are many who them and my local wildlife officer said he has never met a hunter who shot them. I was able to get these pics and the video by staying quietly in my car and shooting out the window to reduce disturbance.